The most common problem encountered that causes such symptoms is Morton’s neuroma; named after Thomas Morton who first observed the condition 140 years ago. Morton, like many today, incorrectly believed that the damage to the nerves was being caused by a ‘side to side’ crushing of the nerves by the metatarsal bones. This explanation is now not entirely accepted because we now know that the nerves actually sit under the transverse ligament beneath the metatarsals, not directly between them. The forces most likely to be causing the problem are vertical ground reaction forces, not ‘side to side’ compressional forces. In physics, and in particular in biomechanics, the ground reaction force (GRF) is the force exerted by the ground or pedal on a body in contact with it, in this case the foot. In the case of cycling the vertical upward ground reaction force is often concentrated via the cleat mechanism through the forefoot causing compression of the tiny blood vessels that supply the nerves causing thickening and damage to the nerves. 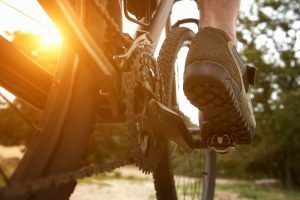 So, what can you do to protect your feet from the risk of Morton’s neuroma or other forefoot problems during a period of cycling? Adjust the cleat mechanism maximally to the rear of the shoe so that the compressional upward force is applied in a less concentrate way behind the transverse ligament thereby reducing the upward compressional forces applied against the nerves. Opt for a shoe with a wide toe box. Many cycling shoes come up narrower than every-day shoes of the same size, but it’s important that you find a shoe which fits you well and gives your forefoot the room it needs. Metatarsal domes can sometimes help, but their placement needs to be exact as incorrect placement can cause further irritation to the inflamed nerve and sometimes inflammation of the joints. A podiatrist or expert cycling shop can assist you with correct placement. If these self-help measures don’t quite work for you, you may need to consider an appointment with a podiatrist to discuss treatment options. Should conservative measures fail to control the condition we typically recommend cryosurgery, which over the years has proved to be an effective safe long-term treatment for Morton’s neuroma. Cycling can be resumed very quickly following cryosurgery typically around 2 weeks after treatment. At the Barn Clinic we offer a cycle shoe assessment to reduce the chance of re-occurrence.